The THJU hip/jack hanger offers the most flexibility and ease of installation without sacrificing performance. The U-shaped hanger works for right- and left-hand hips and can be ordered to fit a range of hip skews (up to 67 1/2°) as well as various single and 2-ply hip/jack combinations. Also can be installed before or after the hip and jack. THJU26 is sized for the standard hip/jack combination with a 45° left- or right-hand hip. The wide seat of THJU26-W accommodates a 2-ply hip and 2-ply jack combination with a 45° maximum hip skew, or a standard single-ply hip/jack configuration with a maximum 67 1/2° hip skew. Intermediate seat widths are available for other hip/jack or hip/hip combinations. THJU is available in intermediate seat widths between 5 1/8" (THJU26 width) and 8 1/8" (THJU26-W width) with no load reduction. 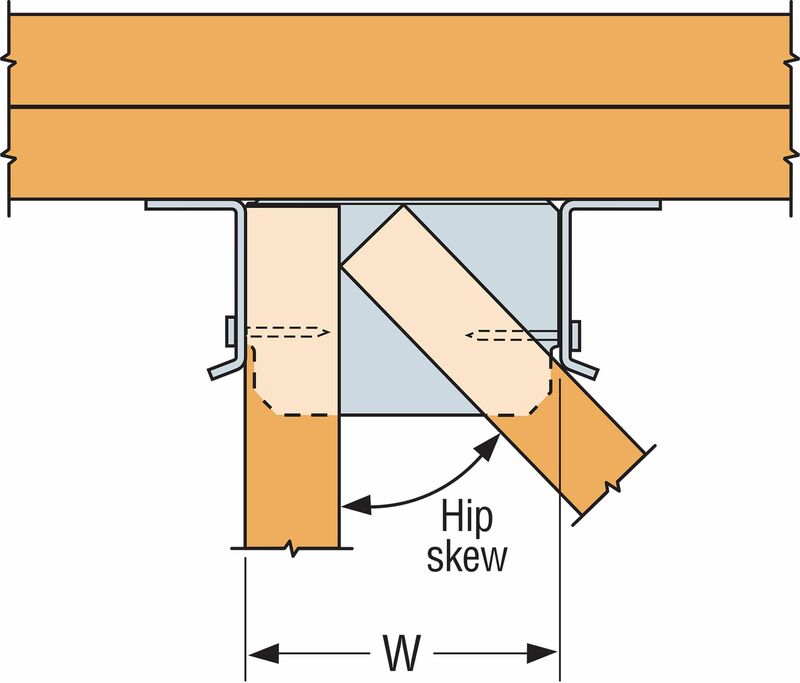 For double-hip installation, divide the total allowable load by 2 to determine the allowable load for each hip. Order as THJU26X and specify width; see table for reference. Allowable download and uplift for all intermediate widths is 100% of the THJU26-W table loads. Tabulated loads are the total allowable loads of the hip and jack members combined; 65%–85% of the total load shall be distributed to the hip member, and the remaining percentage of the total load shall be distributed to the jack. The combined hip and jack load may not exceed the published total load. 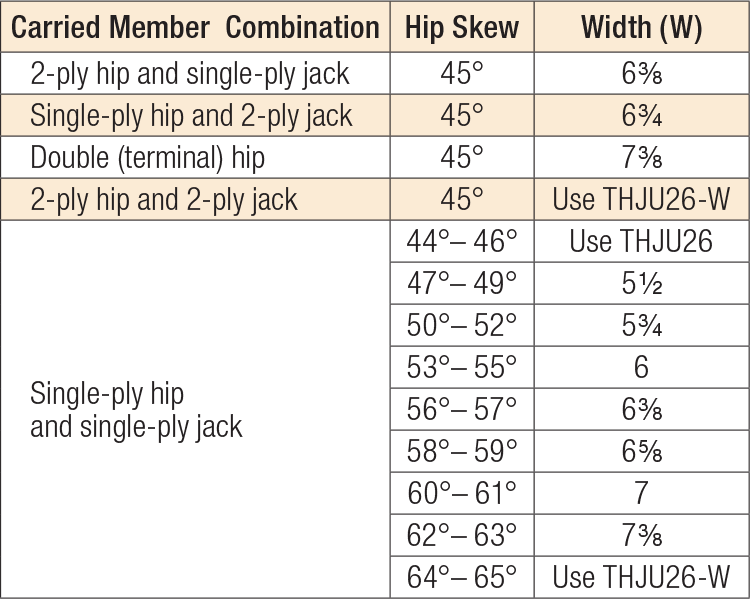 For full load, the jack requires either a minimum 2x6 bottom chord or a minimum 2x4 end vertical; the hip requires either a minimum 2x6 bottom chord or a minimum 2x6 end vertical for hip skews up to 60°. For hip skews greater than 60° (THJU26-W only), a minimum 2x6 bottom chord or minimum 2x8 end vertical is required. With single 2x carrying members, use 0.148" x 1 1/2" nails and use 100% of the table value. For single 2x jacks, 0.148" x 1 1/2" nails may be substituted for the specified 0.148" x 3" with no reduction in load. THJU See specific model numbers for code listings.